Four stroke, transverse three cylinder, DOHC, 4 valve per cylinder. The bold and charismatic Speed Triple summed-up all that was best about the new Triumph firm from Hinckley. With its sleek styling, racy riding position, high-quality cycle parts and exposed three-cylinder engine, the original Speed Triple, launched in 1994, was a spiritual descendant of the Café racers of the 1960s - the days when British bikes, including old-style Triumphs, ruled the roads. If there was one thing above all that the Triple shared with those old Café racers it was attitude. Lean, simple, unfaired but at the same time aggressive and sleek, the Triple was from the same naked musclebike school as Ducati's Monster. With a torquey three-cylinder motor, high quality cycle parts and no unnecessary frills, it was built for coffee-bar cowboys who took their bikes expresso style: simple, black and strong. Depending on how it was viewed, the Speed Triple - whose name recalled one of the great early Triumphs, the 500cc Speed Twin of 1938 - was either a sporty version of Triumph's naked Trident 900 or a naked version of the Daytona 900 sportster. While sharing the basic liquid-cooled, 885cc three-cylinder engine layout and steel spine frame of both bikes, the Triple differed enough from either to be very much a distinct model. Its engine was the same 97bhp unit that powered several other bikes in the range, but the Speed Triple alone had five gears, instead of six. To match its lean look and all-black engine and bodywork (yellow paint was an option), the Triple was also fitted with aluminium silencers whose dark finish resembled carbon-fibre. There was no pretence with the cycle-parts. Forks were 43mm, multi-adjustable Kayaba units; the same Japanese firm's shock could be set for preload and rebound damping. Front brakes were a high-quality blend of 310mm discs and four-piston calipers from Nissin, also of Japan. And the three-spoke wheels held sticky Michelins, the rear a massive 180-section radial. The Speed Triple certainly lived up to its name, thanks mainly to its supremely responsive motor. 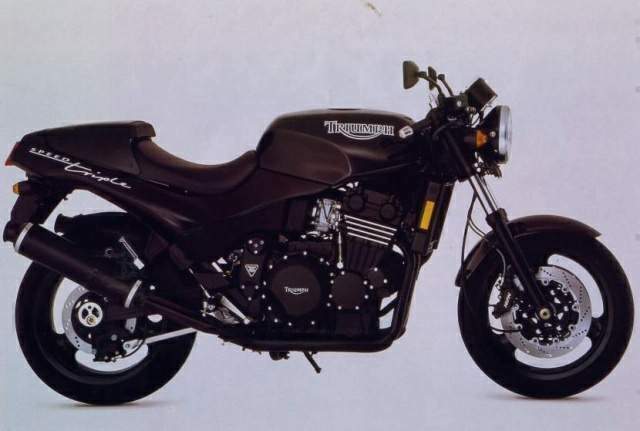 By superbike standards the British machine's top speed of about 130mph (209km/h) was unremarkable, but the Triumph scored with outstanding smoothness and flexibility. Almost regardless of revs, it stormed forward in thrilling fashion in response to a twist of the rider's wrist. Handling was very good, although like other Triumphs the Triple was tall and, at 4601b (209kg), rather heavy. Its rigid frame combined with the sophisticated suspension to give agile cornering without compromising stability. 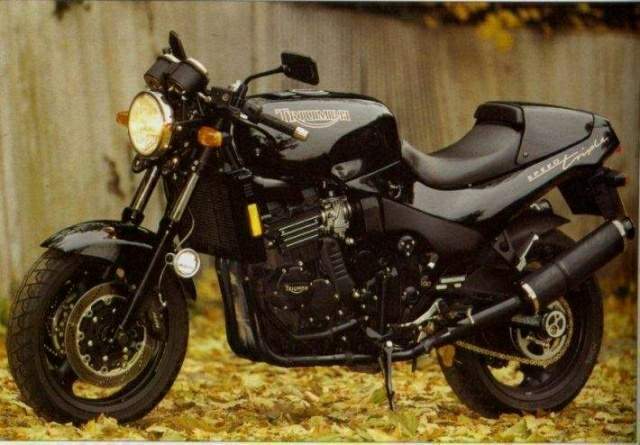 This was the lightest and lowest Triumph model yet, as well as one of the best equipped for hard and fast riding. For day-to-day use the Triple was also reasonably practical, its lack of luxuries offset by a generous fuel range, comfortable seat and good standard of finish. Despite its similarity to other Triumph models, the Triple managed to project a strong and entertaining character all of its own. 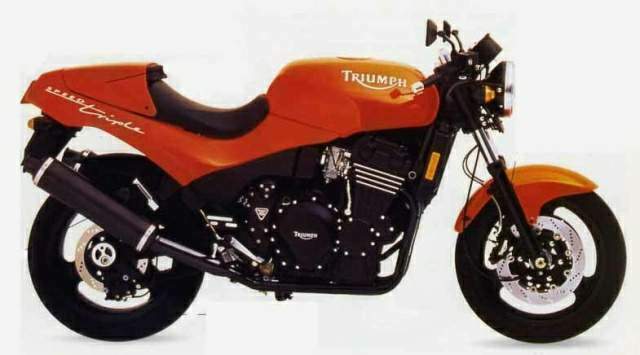 In many countries the naked bike became Triumph's best-selling model, and it was easy to see why. 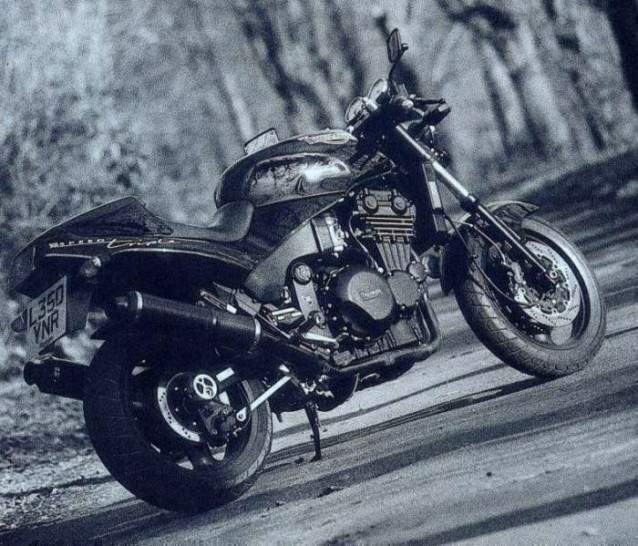 The spirit of the pure, simple British Café-racer lived on in the Speed Triple.